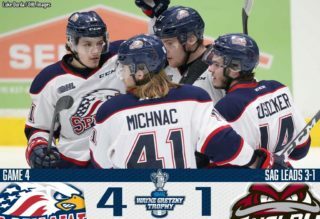 Saginaw, MI – The Saginaw Spirit dropped Game Five of the Western Conference Semifinals, 6-2 Friday evening against the Soo Greyhounds. The Spirit lead the best-of-seven series, 3-2. Philadelphia Flyers first-rounder Morgan Frost was given first-star honors with a hat trick and four points in the game. Los Angeles Kings signee Matthew Villalta stopped 41 Spirit shots in the win for the Soo. The Spirit will look to close out the round two series on the road in Game Six Sunday, April 14 at 7:07 p.m. The Spirit nearly took the lead just over five minutes into the first period with a rush by Edmonton Oilers second-rounder Ryan McLeod. McLeod took the puck wide on the Soo defender and took a shot from the right side of the net and hit the post on the short-side. The Greyhounds opened the scoring 7:05 into the first period with Philadelphia Flyers first round pick Morgan Frost’s fifth goal of the post-season. On a rush up ice, Frost took a shot that McLeod deflected to the glass. The puck took a Soo bounce to the right of the crease and Frost was able to tip the puck into the Spirit goal for the early lead. Zion, Illinois native Cole Coskey nearly tied the game for the Spirit with seven minutes left in the period. The Saginaw right-winger took a shot from the top of the right circle that Villalta deflected with the blocker. 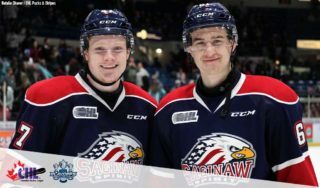 Coskey was the Saginaw Spirit points leader for most of the regular season until he missed the last 12 games of the season with injury. The Soo’s Jaden Peca made it a two-goal lead with 1:30 remaining in the first frame. After a slap shot from Arizona Coyotes first-rounder hit the glass divider behind the net, the puck ricocheted over to Peca at the right face-off dot. Prosvetov never saw the puck bounce off the glass and Peca shot the puck into the open Saginaw net. Despite the 2-0 score at the end of the first period, Saginaw led in the shot department, 14-8. Sault Ste. 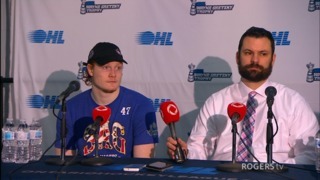 Marie, Ontario native Nicholas Porco nearly cut into the Soo lead with a great individual effort. The 2019 NHL Draft prospect split the Greyhounds defense with a nice move but could not put the puck over the goaltender Villalta. Toronto Maple Leafs signee Mac Hollowell saved a goal for the Soo just over five minutes into the second period. Overager Justin Murray’s rebound shot floated into the air and over Villalta but Hollowell dove behind the net and kept the puck out of the net with his glove. After Saginaw defenseman Mason Millman hit the post, the Soo flew into the Spirit zone on a two-on-one rush. Brighton, Michigan native Keeghan Howdeshell dropped the puck off to Frost who beat Prosvetov with a wrist shot. 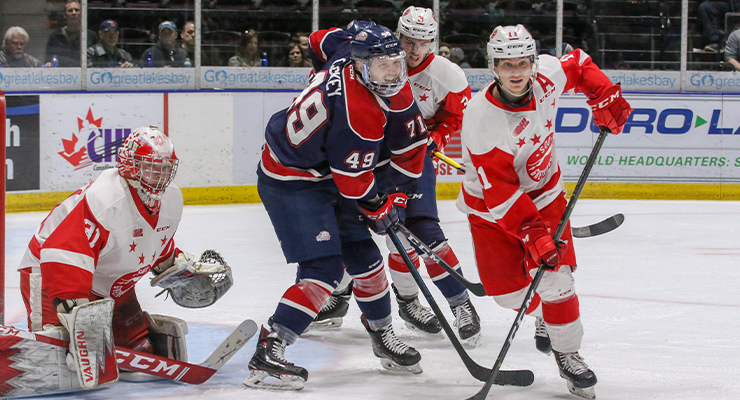 Detroit Red Wings prospect Reilly Webb saved a goal to keep Saginaw at the three-goal deficit. Greyhounds defenseman Jacob LeGuerrier took a slap shot with a wide-open net and Webb sacrificed his body to save a goal. Saginaw found the back of the net 14:49 into the second period with overager Albert Michnac’s first of the post-season. Saginaw center McLeod slid a pass over to Michnac at the left face-off dot and the Czech forward sniped the top-shelf for the goal. The Soo regained the three-goal lead with a power play tally with just over three minutes left in the second frame. Frost used a slap pass from the point to the right of the net where Howdeshell tipped the puck into the Saginaw net. The Spirit doubled up the Soo in the shot department, 30-15 through two periods. The Soo’s Frost completed the hat trick early in the third period to give the Greyhounds a 5-1 lead. Frost roamed near the Spirit blueline for Joe Carroll to hit him with a pass for the breakaway. The Philadelphia Flyers prospect deked and slid the puck through Prosvetov’s five-hole. Rookie Tristan Lennox came into the game in relief of Prosvetov for his first OHL Playoff action. New York Islanders second-rounder Bode Wilde scored the Spirit’s second goal of the game on a great individual effort just over 11 minutes into the third period. The former University of Michigan commit skated around multiple defenders and cut to the net. Wilde took the initial shot from the slot and collected his own rebound to slide the puck around Villalta for the goal. The Soo got the goal back just under seven minutes later with Peca’s second of the game. Zach Trott slid a pass for Peca to redirect into the net from the right side of the crease for the 6-2 victory in Game Five. Los Angeles Kings prospect Villalta has allowed only two goals in the past two games and made a two-game total 66 saves for the Greyhounds. 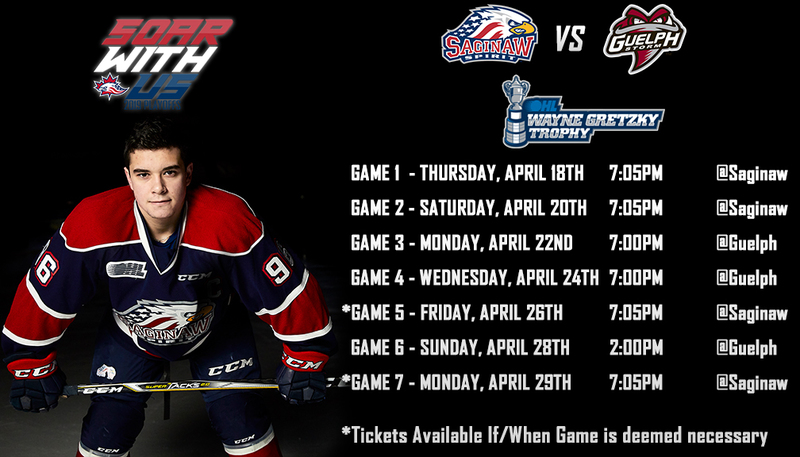 The Saginaw Spirit head back to Sault Ste. Marie as they will look to close the series out in Game Six. Puck drop from the GFL Memorial Gardens is at 7:07 p.m. Fans can follow all the action on the flagship WSGW 100.5 FM Talk and Sports and fmtalk1005.com with Joey Battaino and Dennis Desrosiers on the call. “Countdown to Face-off” begins 15 minutes prior to puck drop for all your pregame coverage.